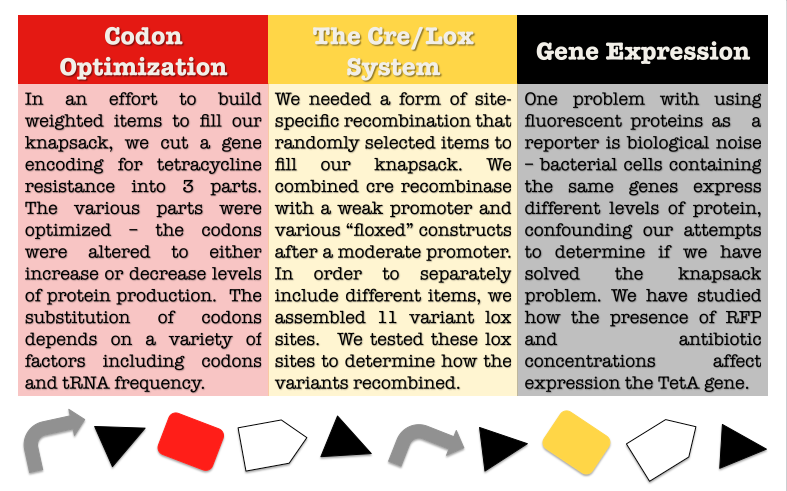 Our summer research project culminated with foundational advances in the fields of codon optimization, cre-lox characterization, and gene expression. The team successfully built 6 tetA constructs with varying levels of codon optimization and deoptimization. We also assembled eleven novel lox sites and characterized interactions between several of them in the presence of cre protein. While choosing and characterizing reporters, we observed variations in gene expression due to environmental factors and inherent variability in bacterial cells. To assist our research, we designed tools such as the VeriPart, the Oligator, the Optimus, the Construct Simulator, and the Knapsack game.